Physicists have managed to create an experimental structure with a strong toroidal dipole response of the electromagnetic field over a wide frequency range. This response is associated with a special configuration of electromagnetic currents causing high concentration of the field. 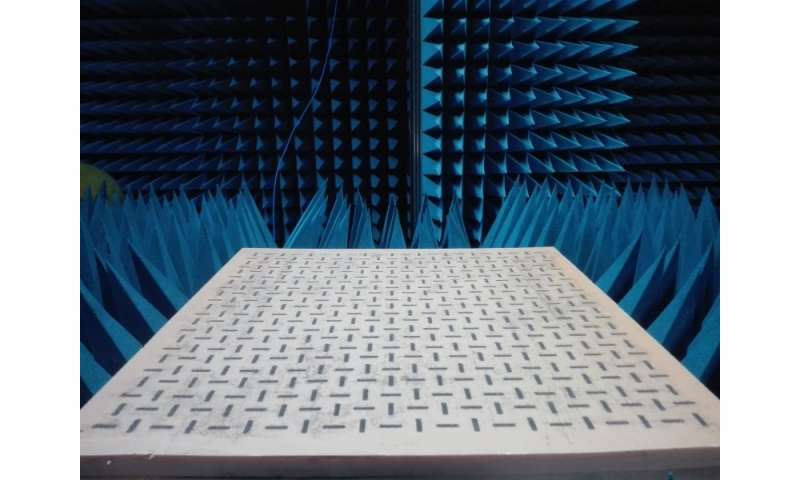 A special dielectric metal lattice was created to produce and measure the response. The results can be used to create non-scattering materials, as well as to control electromagnetic fields. The research was published in Advanced Optical Materials. It is not possible to create accurate sensors or data storage and processing devices without controlling electromagnetic field properties such as energy concentration, direction of the oscillations, or polarization of waves. Regulating the interaction of dipole responses associated with different current configurations in the field gives us the opportunity to change electromagnetic features of an object even to extent of making it invisible. This can be achieved by creating a structure combining two dipole types: conventional electric, and more complex toroidal dipole. Until now, the toroidal dipoles experimentally observed by scientists were either very weak or existed only in an extremely narrow frequency range, which created complications for practical use. Moreover, the experimental structures were based on metals, which led to large energy losses. Scientists from ITMO University along with their colleagues from Iran and Australia managed to overcome these difficulties. They were the first to develop a meta-lattice consisting of dielectric material with a toroidal dipole response dominating over a wide frequency range. "We created a periodic structure which we then tested in a series of experiments to make sure that the toroidal dipole was strong enough. When studying the spectrum and distribution of the electromagnetic field, we registered some features typical for toroidal dipole: the field was highly concentrated and had a strong longitudinal component, which means that the direction of electromagnetic field oscillations coincides with its propagation direction. This can be useful for creating molecular sensors or producing nonlinear effects in optics," explains Andrey Sayansky, Ph.D. student at the Faculty of Physics and Technology of ITMO University. To create the meta-lattice, the scientists used indium and gallium phosphides. The refractive index of these dielectric materials is lower than the index of regular ones like germanium or gallium arsenide. However, the results showed that the more affordable "medium" dielectrics can also be used to avoid energy loss. Scientists hope that this will contribute to the more active research and practical application of such structures. Another major finding was that the meta-lattice toroidal response can be excited by any polarization wave. This will help expand the scope of application of meta-lattice-based materials and devices. "We did not develop a non-radiating material, but we laid the foundation needed for its creation. Our findings are also suitable for a variety of other applications. The principle of the toroidal dipole control demonstrated in our research can serve to create sensors, control light and transmit or store information," says Andrey Miroshnichenko, professor at the University of New South Wales in Australia.